Gently open can of coconut milk and scoop off the top thickened cream. You can use the clear liquid on the bottom in smoothies. Transfer to covered storage container and store in fridge until ready for use. Place a hand full of coconut chips in a dry saute pan on medium heat and saute dry until lightly toasted. Transfer to a bowl,set aside until ready for use. Place milk and one cinnamon stick in medium saucepan over medium heat until hot, but not boiling about 180 to 190 degrees. Stir in chocolate until all melted and smooth. 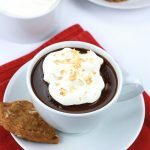 Pour into mug, garnish with whipped coconut cream and toasted coconut.